Does this sound familiar? You open your piano student’s piano bag and haul out their piano books. The newsletter you sent home with them last week to give to Mom flutters to the ground. Their books have clearly not been opened for a week, their piano practice chart is barren, and your carefully thought-out comments have not been read. Sound familiar? If so, you happen to have the pleasure of teaching a Mr. (or Mrs.) Casual McTryitout. You are probably left wondering how to teach piano to a student who doesn’t particularly care if they learn to play the piano! Learn The Piano In Just 30 Minutes A Week! We have all had these kind of piano students: The ones who only learn to play the piano because of the blood sweat and tears you shed during their weekly piano lesson as you desperately cram as much teaching and supervised practice into the 30 minutes as you can possibly muster. Amazingly, your student will make it through a piece or two during the piano lesson with you, and you send them on their way hoping against all odds that they will remember to bring their piano bag in from the car when they return home (even though it sat in the trunk all week last week). These kinds of lessons are exhausting and yet boring all at the same time. It’s not a great combination. Mr. Casual McTryitout doesn’t seem to care if he progresses at all. Neither do his parents. They’re happy to continue paying you weekly for 30 minutes of piano instruction, but they are seemingly not interested in what you have to tell them. Occasionally, in a bout of sudden guilt, they may drag the piano books from the garage for a feverish cramming session the night (or the hour) before their lesson with you. But usually they offer a hurried word of apology and perhaps an excuse or two for good measure as Mr. Casual heads into his lesson with you. These students are tough – but you are wily. Here are some ideas for how to teach piano in a way that will turn Mr. Casual McTryitout into Mr. Committed McCaresalot. 1) “You are a pianist! Didn’t you know?” – In situations like this the encouragement (or pressure) to pursue piano wholeheartedly is obviously not coming from anyone at home, and so you need to become both his number one motivator but also his number one fan. Help him to identify himself as a pianist. Find every way possible to make it “his thing” by boosting his confidence on the piano. If he can learn to see himself as a pianist, then the piano will become a priority in his life. If it’s “just one more thing” that he’s driven to each week, the piano will fall by the wayside… it’s an activity that quickly becomes difficult to do casually. 2) Create a reason to practice – One recital every five months or so is not enough of a goal for students like these who prefer to float aimlessly through months of lessons. Give him deadlines that are both exciting and frequent. Set up his very own youtube channel (with permission from parents of course) and give him a recording schedule that requires him to be performance-ready every 3 weeks for his newest video. Schedule mini-concerts or group master classes, have him perform in the community regularly. Anything that puts that perception of a deadline in his mind will help to increase practice time. Once you get students like this practising and progressing they’ll quickly find the joy that piano provides. 3) Find Strength in Numbers – Find ways to gather students at your studio in groups. Mr. Casual McTryitout will quickly see the level his peers are playing at and, in more cases than not, feel the need to both catch up and keep up. There’s nothing like a little perceived peer pressure to light a fire under a drooping student. Surrounding your Mr. Casual with Mr. Committed(s) provides opportunities for him to see good “piano modelling” which he is likely to emulate. 4) Resist the urge to pack it in – Many teachers will tell you these students just aren’t worth it… to send him on his way sooner than later. 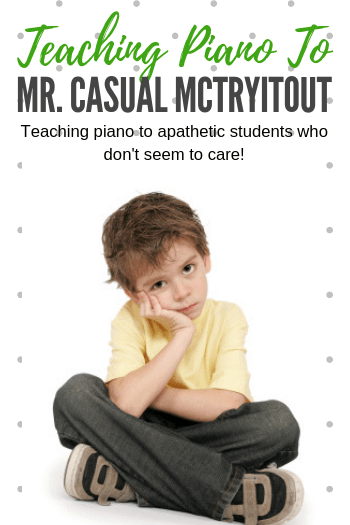 And while it certainly is tempting at times to wash your hands of students like these, I have a soft spot for Mr. Casual McTryitout… a soft spot, and a determination to not let piano become “one of those things he tried out for awhile”. The benefits of music in the life of a child are way too important to allow piano lessons to be be lumped in with the speed skating club, springboard diving and pottery classes he also drifted through and quit. Be different than all the other instructors who were happy to let him fall through the cracks. Instead, commit to teaching him to play the piano. And in doing so you’ll teach him a whole lot more. We have teachers write to us week after week to say “Thank you!”. Why? Because our supplementary repertoire books The Adventures of Fearless Fortissimo were exactly what was needed for them to turn a Mr. Casual McTryiout into a raving piano fan who won’t stop practicing! Check it out here.